9 Jan : In a relief to consumers across the country, the officers of public sector oil companies including ONGC, IOC, BPCL, HPCL, GAIL and Oil India have called off their strike as a number of striking employees have returned to work. Assuring that the situation will be normal by Saturday morning, Petroleum Minister Murli Deora on Saturday asked the people not to resort to panic buying of petrol and diesel, saying the strike called by the employees of state-run oil firms is over. The Minister said that the supply at BPCL outlets is improving and all HPCL outlets are working.Expecting the situation to improve at IOC by Saturday, Deora said, ‘IOC Panipat refinery will start operating tonight, while Mathura refinery will start functioning with in 12 hours. Earlier, the Prime Minister appealed to striking officers to resume work immediately while the petroleum product supply situation is slowly coming back to normal as a number of striking employees have returned to work. Earlier, briefing after the cabinet meeting Home Minister P Chidambaram said that the government will take firm action against striking worker.Speaking to DD News, Petroleum Secretary R S Pandey said that striking officers of most of the downstream companies are now returning to work Government cracked the whip after Oil Minister Murli Deora briefed Prime Minister Manmohan Singh on the failure of talks with Oil Sector Officers Association (OSOA) last night, goading Bharat Petroleum, Oil India and Engineers India executives to return to work to avoid dismissal and arrests. OSOA struck work on 7th January to press for higher wages, holding the country to ransom by stopping oil and gas output and disrupting fuel supplies that brought road traffic to a halt and delayed domestic and international flights. About 12,000 petrol pumps of the largest fuel retailer, Indian Oil, and over 3,000 of BPCL was out of stock, leading to mile-long queues at HPCL outlets. Mumbai ran out of compressed natural gas (CNG) that runs some two lakh buses, taxis and autos but Delhi had enough CNG and piped natural gas stocks to last 7 to 10 days. However, with gas available from ONGC, as many as 138 CNG stations would be fully functional by tonight, Petroleum Secretary R S Pandey said. 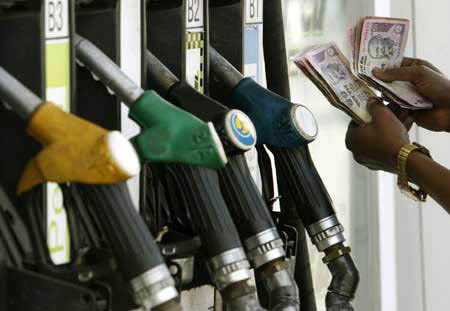 Petrol, diesel supply situation will improve with BPCL executives calling off the strike and army taking despatch and loading operations of IOC at Delhi. "Tough is an understatement," Deora said, even as Pandey said that army has been called in and arrest orders are being issued against those who are not relenting. Officers of ONGC and IOC continued to boycott work. IOC Chairman Sarthak Behuria said list of officers has been sent to district authorities with instruction for arrest if officers do not join duty by Saturday. "The Minister of Petroleum and Natural Gas and Secretary have been instructed by the Prime Minister to take firm action," Home Minister P Chidambaram told reporters after a meeting of the Cabinet, which was briefed on the situation on Friday morning. Chidambaram, who has been asked by the Prime Minister to head a committee to resolve the grievances of the oil PSU officers, said the Centre has advised state governments to take firm action. "Firm action is being taken and will be taken," he added. The Crisis Management Group headed by Cabinet Secretary K M Chandrasekhar took certain decisions to deal with the situation, he said. "Those decisions have been communicated to the state governments as well as to other authorities and those decisions will be implemented," the Home Minister said without elaborating. The Home Minister said the oil PSU officers should not "cripple" the economy and should be resorting to strike as the government has an open mind to address their grievances related to pay revisions. While the strike entered the third day, with long queues at several petrol pumps, government was non-committal whether the situation could be brought under control immediately. "I cannot promise there will not be shortage anywhere but every effort is being made to handle the crisis," Chidambaram said.He, however, said HPCL was functioning normally, while BPCL was working 70 per cent till Friday morning and is "likely to improve". Chidambaram said officers of HPCL and largely of BPCL have realised that strike was not the way to go about pressing their demands.He said he has been asked by the Prime Minister to look into their grievances. "I wish to keep an open mind… My appeal to them is I am willing to hold the first meeting even today. They must come to meet me." "They must call off their strike. They must recognise the intolerable burden they are placing on the people of India. If LPG is not available, how will families cook food for their children? If diesel is not available how will cars, buses run?" he said.